Human fascioliasis has the widest latitudinal, longitudinal and altitudinal distribution of any vector-borne disease, yet only 3 cases have been reported from South Africa, the last in 1964. We report 2 cases from the same geographic area associated with local consumption of watercress, suggesting an endemic focus. Three cases of human fascioliasis have been reported from South Africa (SA), the last in 1964. We report two cases of fascioliasis, suggestive of an endemic focus in the Eden district of the Western Cape Province. A 73-year old female from Natures Valley, Eden District, Western Cape Province, SA presented with 2 weeks of fever, rigors, anorexia, weight loss, non-productive cough and malaise. Seven months previously, she had travelled to northern Zambia where she camped, ate tinned foods purchased from SA, and drank only filtered water. Neither fish nor salads were ingested. Fever of 39.6oC was the sole finding on examination. She had an eosinophilia of 3.1 x 109 cells/l and raised C-reactive protein (CRP) of 62 mg/l. Renal and liver function tests were normal. Serology for schistosomiasis, strongyloidiasis and 5 repeat stool examinations for helminth ova, cysts or parasites were negative, as were malaria blood films. An ultrasound scan of her abdomen showed hepatomegaly with multiple areas of subtle hypoechoic, slightly inhomogeneous parenchymal echotexture. 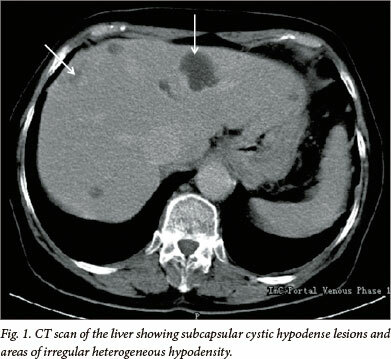 A computed tomography (CT) scan confirmed subcapsular, cystic hypodense lesions and multiple irregular heterogeneous hypodense lesions (Fig. 1). Echinococcus and Entamoeba serology were negative. Liver biopsy revealed eosinophilic microabscesses and Charcot-Leyden crystals formed by the breakdown of eosinophils. The patient received 3 days' treatment with albendazole, a 40 mg/kg stat dose of praziquantel, and broad-spectrum antibiotics prior to transfer to Groote Schuur Hospital (GSH), Cape Town. Dietary history revealed ingestion of watercress bought from a farm stall in Natures Valley in the 3 months prior to presentation. Both her eosinophilia (4.2 x 10' cells /l) and CRP (100 mg/l) had increased, and her alkaline phosphatase (275 U/l) and gamma glutamyltransferase (116 U/l) were raised; normal bilirubin and transaminase levels were noted. Differential diagnoses, including human fascioliasis, toxocara visceral larva migrans, ectopic biliary ascaris, chronic eosinophilic leukaemia (CEL) and hypereosinophilic syndrome (HES), were considered. Cytogenetics ruled out CEL and she did not meet the diagnostic criteria for HES. She received 21 days' albendazole (400 mg twice daily), with transient symptomatic improvement. Fasciola immune fluorescent antibody titre (IFAT) assayed at the Department of Parasitology, Hospital for Tropical Diseases, London, UK, was positive at a titre of 1:256. Triclabendazole, not registered for human use in SA, was accessed through the Medicines Control Council of SA. The patient's symptoms resolved within 10 days following a single dose of 10 mg/kg; at 1 month, her eosinophil count was 0.8 x 10' cells/l; at 6 month follow-up, she was asymptomatic with a normal eosinophil count. A 37-year-old female chef from Plettenberg Bay, Eden district, Western Cape, SA, presented with a 1-week history of progressive dyspnoea, palpitations, central chest pain and sudden onset weakness with expressive dysphasia. She was treated for a non-ST elevation myocardial infarction, complicated by pulmonary oedema, hypotension and stroke. Eosinophil count on admission was 0.73 x 10' cells/l. After 1 month, she was transferred to GSH for evaluation. She was afebrile, with a petechial rash on her abdomen, legs and hard palate, and bilateral fingernail splinter haemorrhages. She had global ST repolarisation abnormalities on electrocardiogram, anteroseptal hypokinesia, mitral regurgitation without vegetations, and an ejection fraction (EF) of 58% on echocardiogram. Cardiac magnetic resonance imaging (MRI) showed biventricular systolic dysfunction; late gadolinium imaging revealed the presence of left ventricular thrombus and a non-ischaemic subendocardial enhancement with a classical 'zebra sign', compatible with a diagnosis of endomyocardial fibrosis. Brain MRI confirmed lacunar infarcts in the centrum semi-ovale bilaterally and bilateral watershed territory infarcts suggestive of a vasculopathy. The total white cell count was 13.6 x 10' cells/l, with an eosinophil count of 3.08 x 10' cells/l. Five stool samples were negative for helminth ova, cysts and parasites. There was no family history of eosinophilia, allergies or medications and the patient had never traveled outside of SA. She admitted to frequently using locally purchased watercress in salads and food prepared at work and for personal consumption. Autoimmune screen and hepatitis A, B, and C, coxsackie, coxiella, cytomegalo- and Epstein-Barr virus serology was negative. Bone marrow was hypocellular with normal lineage haemopoiesis and a mild, focal increase in eosinophils; there was no morphological evidence of myeloproliferative disease or lymphoma. Cytogenetic studies and chromosomal analysis were normal. Endomyocardial fibrosis with thrombotic complications and encephalopathy was the working diagnosis. Treatment with prednisone (1 mg/kg) and albendazole (400 mg twice daily) was started. The patient's clinical course was complicated by impaired renal function, hepatitis, recurrent episodes of atrial flutter and worsening heart failure. She survived a cardiac arrest. Subsequent cardiac catheterisation revealed unobstructed arteries, obliteration of the apices of both right and left ventricles, restrictive myocardial function and mitral regurgitation, and dilated left and right atriums. Endomyocardial biopsy showed organised thrombus. She underwent heart transplant, histology of the explanted heart confirming endomyocardial fibrosis. Toxocara, schistosoma and strongyloides serology returned negative, but fasciola IFAT assayed at the Department of Parasitology, Hospital for Tropical Diseases, London, UK, was positive at a titre of 1:256. Single dose triclabendazole was administered post-operatively. The patient died suddenly at home 2 months following discharge, post mortem examination confirming cardiomegaly with severe rejection, pericarditis and presence of mural thrombus in the left atrium. The global burden of human fascioliasis is estimated at between 2.4 and 17 million infections occurring in at least 51 countries over 5 continents. [2,3,4] Fascioliasis represents the widest latitudinal, longitudinal and altitudinal distribution of any vector-borne disease known, a reflection of the parasite's ability to infect a broad range of definitive hosts, and the adaptability of the intermediate snail host Lymnaea, to a wide variety of biotypes. The epidemiology of human fascioliasis in SA is unknown. Two reported cases from Cape Town in 1956 and one from Johannesburg in 1964 presented with features of chronic infection. The fluke was extracted from the biliary tree of 1 patient, and fasciola ova were observed in the stool of the other 2 cases. Watercress ingestion was confirmed in 2 cases. Transmission of fasciola to humans is attributable to environmental contamination by infected animals, followed by the ingestion of metacercariae present on watercress, other aquatic plants or contaminated water. Susceptible domestic animal hosts include cattle, sheep, pigs, goats and donkeys, and putative SA wild animals such as buffalo and kudu may be implicated. [3,7] Condemnation rates of fasciola-infected cattle and sheep livers of up to 10% were noted from municipal abattoirs in 1956, while current estimates from the Knysna abattoir in the Eden district are also 10%, with most cattle livers coming from emerging farmers' livestock (personal communication, Dr Edwin Dyason, State Veterinarian, George). Coprological fasciola prevalence in the Buffalo City municipality of the Eastern Cape was 16.33% with an increase in egg counts noted over the summer period (October to January).Intermediate snail hosts, Lymnaea truncatula and Lymnaea columella, are found in 5 of SA's 9 provinces, including the Western Cape. This report highlights a potential endemic focus of human fascioliasis in the Eden district of the Western Cape. Both patients ingested watercress bought from local markets. Although acute fascioliasis may present with abdominal pain, it is often asymptomatic and unlikely to be considered in the differential diagnosis of most physicians. The perception that fascioliasis is rare or non-existent in SA is likely to result in a delay to diagnosis, unascribed morbidity and mortality. An epidemiological investigation is currently underway to determine the extent of endemicity of human infection in the Eden district. Acknowledgements. We acknowledge Lucille Blumberg and John Frean from the National Institute for Communicable Diseases, Johannesburg, for their helpful advice with respect to case 1, and the late Johann Steyn, for his valuable input into interpretation of the MRI in case 2. We would also like to thank Peter Chiodini and the Department of Parasitology, Hospital for Tropical Diseases, London, for performing diagnostic tests for fascioliasis.